On Raw, HHH told the world why he rejected the Undertaker’s challenge to a rematch at Wrestlemania 28. HHH said there was always a chill that went up his spine when he was in his presence. Last week, he didn’t feel the same way as he looked into his eyes and instead felt sad for him. He knows what type of beating he gave the Undertaker last year and now he knows the dead man’s limit. HHH said he would take him out once and for all and suggested that this may be what Taker wants but he won’t be the guy to do it. As HHH leaves, his music stops and the lights go out. A video message form the Undertaker airs stating his victory over HHH means nothing as he stares at images on a wall of him being carried out ala Ray Finkle style. He offers him one more chance at immortality and vows this is not over. The buildup to this match will only get better as we head into Mania. In victory, Taker was carried out like a beaten loser and HHH has denied him his shot at redemption. 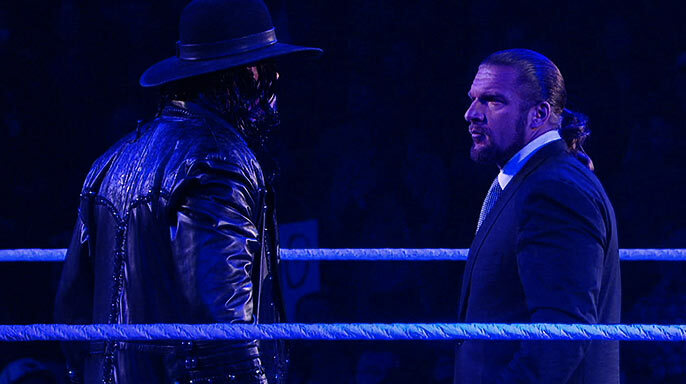 What will the Undertaker do to make HHH go back on his word? We know the match is going to be made official at some point and it’s intriguing on many levels. Undertaker wants a win he can walk away from and HHH has to beat him worse than he did before in order to end the streak. In order for this to work there is only one end game. The match absolutely has to be better than the last one. It can’t be on par, and it can’t be four stars instead of five. It has to be better to ensure the payoff is right. They arguably had the best match at Wrestlemania 17 and unquestionably had the best match at Wrestlemania 27. Contemporary wisdom says a young guy should get the rub form working this pivotal match. The problem emerges as talent is thin and believability is absent. Look at the roster of young heels and tell me who me who can fulfill the prerequisites of having a five star match and the authenticity and credibility to beat the Undertaker? Wade Barrett? No. Dolph Ziggler? No. Jack Swagger? No. Daniel Bryan? No. The Miz? Maybe, but the odds say no. In the end, I think we are going to be alright. We complained when HHH got the nod last year and we marked out with thunderous applause when we saw the finished product. I’m willing to bet this year will produce the same result.